Tokyo-based artist Azuma Makoto teamed up with JP Aerospace for a mission called "Exobiotanica," which sent two plant pieces into the upper atmosphere: a Japanese white pine called "Shiki 1" and the above arrangement of peace lilies, poppy seed pods, dahlias, bromeliads, orchids, hydrangeas, lilies, and irises. Makoto told The New York Times' T Magazine, "I am using brightly colored flowers from around the world so that they contrast against the darkness of space." To record the plants' flight, the team used cameras donated by Fuji Film and six Go Pro video cameras tied in a ball to get a 360-degree view. At 6:30 AM last Tuesday, Shiki 1 was launched. It traveled up 91,800 feet, traveling 100 minutes until the helium balloon burst carrying it burst. 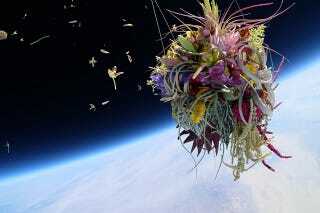 The flowers made it 87,000 feet. The bonsai and the flower arrangement were never found. What a way for a 50-year-old bonsai to go.